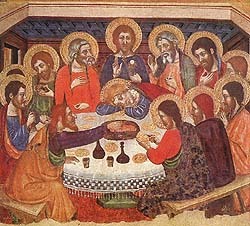 Jaume Serra, "The Last Supper" (1370-1400), Tempera on wood, Museo Nazionale, Palermo Larger image. One word stands out because it is repeated again and again — the Greek word koinonia, "participation" (NIV) also translated as "communion" (KJV) or "sharing" (NRSV). It means sharing something in common with others, common participation in something with other people. Now available as a modestly-priced e-book and printed book. Why don't you purchase a copy today. Learn more. We participate with all the others who partake of the one loaf, the one Bread who unites us all — Catholics and Protestants, Orthodox and Pentecostal. We are one at the Lord's Table. We participate in the body and blood of Jesus, sacrificed for our sins. When we partake we confirm again their saving power on our behalf. We participate, in a sense, in the altar of sacrifice. The Jewish priests sacrificed upon an altar in the temple. But the "altar" upon which the Lamb of God was slain is the cross. By eating the elements of the Lord's supper we participate, in a sense, in the cross itself. We affirm that we are crucified with Christ. The Lord's Supper is a remembrance. It is also a participation with Christ himself and with all others who follow him.